I have another surprising find at Dollar Tree to show you today. L.A. Colors has some really neat glitter polishes out now for only $1! I found a whole bunch at Dollar Tree recently. This one of them I picked up. 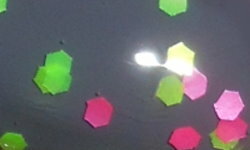 Fruity is a mix of neon green, yellow, and pink satin glitters in a clear base. Color: This is a fun mix of glitter colors. Neon glitters are not easy to find in the drugstore, much less at Dollar Tree for $1! Formula: This can't be perfect. You do get what you pay for here. What you win in color you definitely lose in formulation. This is a very sparse glitter in a heavy clear base. It is difficult to get glitters on your nail to stay on your nail. Dabbing is a preferred method. That being said, it's not atrocious, but don't expect a glitter bomb here in the slightest. Overall: For what it is it's great! Glitters like this for $1 are impossible to find in other brands, so this a winner in that retrospect. Formula is lacking, but shouldn't detract you from purchasing if you don't have a glitter like this in your collection, but want one. What a fun neon glitter topper! Would painting the polish on a sponge and then dabbing the glitter on the nail help? The suspension gets absorbed so just the glitter gets applied, I think.